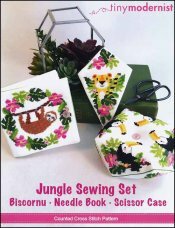 Jungle Sewing Set [C5204] - $12.00 : Yarn Tree, Your wholesale source for cross stitch supplies. Cross stitch pattern from Tiny Modernist. It's a sloth, a tiger & toucans....oh my! The needle book features a sloth hanging onto a branch with a floral border encompassing the design. Look out for the lion hiding in the jungle on the scissor case! You can't forget the beautiful toucans on the biscornu! It's a busy day in the jungle! Stitch counts: Biscornu 73w x 73h, Needle Book 132w x 63h & Scissor Case 90w x 90h.